Troubled by the degradation of environment on and around railway tracks, the National Green Tribunal (NGT) recently directed Delhi government to relocate all illegal settlements along tracks in Delhi. The tribunal reasoned that the residents of these settlements practise open defecation and litter on the tracks. Housing of the landless urban poor is regularly destroyed, citing many reasons such as beautification and security. But environment protection as a reason has entered the dialogue on slums and resettlement for the first time. A Public Interest Litigation (PIL) was filed before the NGT in Delhi on July 26, 2014, asking for the "huge amount of plastic and human waste" on railway stations and tracks across India to be cleaned up. The petition highlighted the railways’ insouciant attitude towards environment. Instead of responding to an inquiry into the railways' dubious sanitation and environment management record, the counsel for the railways argued that "the main source of pollution at the tracks are jhuggies (slums) situated (nearby) and, hence, the problem will only be solved after the removal of such jhuggies". Why do people defecate on the tracks? No one would challenge the fact that residents of jhuggies litter the tracks. But we fail to consider why people defecate in the open instead of using toilets. Can we get rid of open defecation by getting rid of the people responsible for it? Or is there a deeper problem of our sanitation infrastructure? The answer is a no-brainer. Instead of wondering what to do with half a billion Indians who defecate in the open, the Union government is running a mission to provide a toilet to each of them. The Delhi Urban Shelter Improvement Board (DUSIB) submitted a slum-free city action plan (SFCAP) to Delhi government for approval earlier this year. It notes that only 16 per cent of the population living in city slums has a toilet within their residential premises, while over 22 per cent have no access to a toilet. DUSIB has been working on a strategy to provide toilets to these slums, but the NGT direction to relocate settlements instead of retrofitting them seems to have thrown things off track. Additionally, the NGT directive seems to have come as a blessing in disguise for the railways. Firstly, it has helped the railways successfully dodge its environment responsibility and accountability. Railway projects are anyway exempt from procuring environment clearances which are mandatory for most big development projects. Secondly, it finally paves the way for the railways to reclaim its land currently occupied by jhuggies. It is estimated that the railways is India's single largest land owning agency with a substantial surplus of land. The railways has of late started viewing land under its possession as an asset which can be commercially exploited. In 2006, a dedicated authority—Railway Land Development Authority (RLDA)—was set up to prevent encroachments on and generate revenue from unutilised railway land. Public records state that less than 0.5 per cent of railway land was encroached upon in 2006. But this land is of utmost importance to RLDA since most of it is in and around urban centres and has high commercial value. For instance, there are nearly 70 km of railway tracks in and around Delhi, of which 22 km are encroached upon, as per records submitted to the NGT. Urban land is in short supply and highly contested. In fact, half of Delhi’s population lives in jhuggies and unauthorised settlements. According to the sixty-ninth Round of National Sample Survey, 28 per cent of about 6,343 slums in Delhi are on railway land. Though the land belongs to the railways, many residents have legal leases for their structures from different state authorities. Some jhuggies along railway lines in Delhi have been in existence for more than 30 years. Pul Mithai in old Delhi is one of the city's most known slums on railway land. The railways first demolished this settlement in the 1990s and subsequently, in 2006, 2008, 2009, and 2010. During the last demolition drive, the authorities were supposed to demolish only vacant quarters, but they ended up demolishing up to 500 houses, not all of which were vacant. People returned and revived the slum as the location was critical to their occupation. Pul Mithai is adjacent to one of the biggest wholesale grain markets of the city, and the main occupation of slum's residents is to sell segregated grain chaff in the market on Sundays. The market and slum are interdependent and no resettlement can work if their symbiotic relationship is not accounted and provided for. In short, the most workable solution for Pul Mithai can only be in-situ redevelopment. But will railways let go of this prime property and pay for its equitable redevelopment? The railways does not take responsibility for the rehabilitation of those evicted from its land. It does not have an existing resettlement and rehabilitation policy. It treats housing as a state subject. This means that the responsibility of rehabilitating the evicted lies with the particular state government, under whose jurisdiction the jhuggi is located. But as per the Railway Board guideline, the encroached railway land, if not required by railways can be leased out to the state government for 35 years by charging 99 per cent of the market value. But this pricing is not affordable for even a city like Delhi, especially when the land is to be used for low-income subsidised housing projects. In some instances, however, the railways has been made to undertake rehabilitation. In Mumbai, railway authorities were made to provide housing to those evicted from land close to the Dahisar and Andheri railway tracks. These households were given houses of 270 sq feet near the original land. This became possible because the Maharashtra government had been strict about implementing its Slum Redevelopment and Resettlement Act, 1971. The Act states that any slum household that has been in existence before the year 2000, and is project-affected, will be rehabilitated without fail. The only eligibility criterion is that the household must have members listed on the voters’ list. Till recently, the Government of Delhi’s Rehabilitation and Resettlement policy stated that the cost of relocation of slums, existing on railway land in the National Capital Territory prior to 1998, is to be borne by the railways. Under this policy, DUSIB took Rs 11.25 crore from the railways in 2003-04 to demolish 4,410 houses in jhuggies located near the railway track in Sanjay Camp and Wazirpur area and resettled those affected. This policy didn’t require the railways to undertake the relocation of people or to provide land for resettlement. Since Delhi government itself doesn’t own much land in the city-state (most of Delhi’s land is owned by Delhi Development Authority, which is controlled by the Union government), the cost of purchasing land in Delhi at market rates for such a large-scale relocation required more than Rs 11.25 crore. In fact, the latest official cost estimate for construction of a basic 250 sq feet unit is Rs 3.34 lakh, which takes the cost of 4,410 units to over Rs 147 crore. It was an arrangement that was doomed to fail. And it did. Now the NGT wants Delhi government to deliver on this highly flawed scheme. The experience with slum relocation has also not been encouraging. Resettlement colonies of Savda Ghevra and Bawana in northern Delhi were in many ways worse than the slums. The quality of housing was poor and basic amenities and infrastructure were missing. There was no connectivity with the city’s public transport network which deeply severed the livelihood access of these households. The resettlement colony at Bhalsawa in northwest Delhi, on the other hand, has better quality housing and connectivity. But it is located on a reclaimed landfill with highly polluted water and land. Further, the maintenance cost of the high rise apartments in these resettlement colonies places extra burden on already poverty-stricken families. Naturally, many choose to leave these colonies and return to slums where they at least had jobs, if not a legal status. Thus, the question arises—is resettlement enough? Delhi's AAP government recently approved a new slum policy which addresses the fundamental issues with relocation by mandating in-situ rehabilitation. The policy stipulates a cut-off date—February 14, 2015—to be eligible for rehabilitation and relocation. After this date, relocation will be done only if there is a court order or the concerned cluster has encroached upon a street, road, footpath, park or the encroached land is required by the land owning agency for a specific public project. The Delhi government is also contemplating introducing a clause to restrict the distance of the relocation site from the original location. But who will provide or pay for the land where it is needed is a question that remains unanswered. DUSIB plans to free up 197.23 hectares of land encroached upon by slums and sell it to finance its ambitious slum-free city scheme. Under this scheme, it plans to construct almost 150,000 flats. This sale is likely to fetch a price of Rs 14,526 crore, which will cover a part of the total project cost of Rs 37,235 crore. Similarly, the NDA government’s Pradhan Mantari Awas Yojana (PMAY) seeks to solve the problem of rehabilitation cost with the participation of private developers. But these schemes see slum land as a commodity which can be cashed. This model envisages the development of land occupied by slums by shifting the residents into compact high-rise towers and freeing up most of the land for private commercial interest. There would have been nothing wrong with this approach had slums occupied large tracts of land. In Delhi, less than three per cent of the land is under slums which house 30 per cent of all Delhi households. Shifting the residents into more cramped accommodation would hardly qualify as good policy. India requires more than 18 million housing units to house its citizens even as 11 million houses lie vacant in the middle and higher income group. The irony is that the poor cannot afford what is vacant and what it can afford, needs to be vacated. NDA government's PMAY aims at housing for all by 2022 mission, but the rate at which informal housing is being destroyed far exceeds the rate at which formal housing is being constructed. Increasingly, governments across the globe have come to recognise the right of people to occupy unutilised land for housing as their livelihood is intrinsically linked with where they live. The right to occupy unused land is guaranteed in Brazil's constitution. But in India, citizens don’t have such rights. In fact, we have the Public Premises (Eviction of Unauthorized Occupants) Act, 1971, which prohibits the general public from occupying any public premises. And this year, the Parliament amended the Act, providing even more power to government authorities for the speedy eviction of unauthorised occupants from public premises. The railways has interpreted this act to consider even its unused land as public premise and has been forcing evictions. 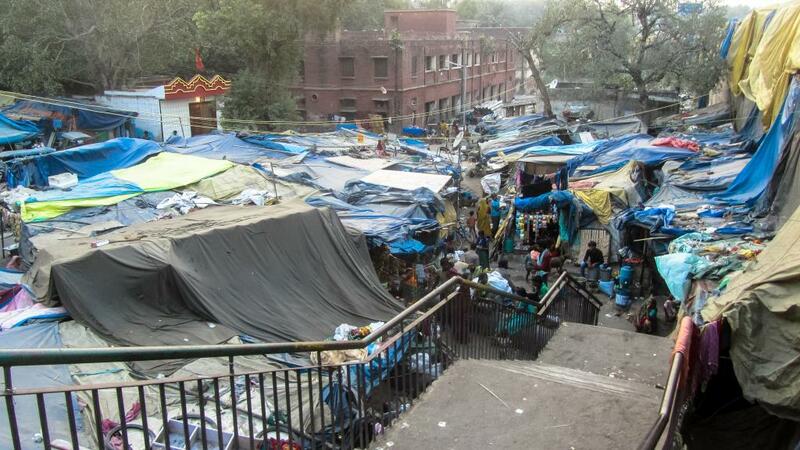 As per the National Sample Survey, about 90 per cent of Delhi slums were built on public land, owned mostly by local bodies (46 per cent), railways (28 per cent) and state government (16 per cent), and only about two per cent of the slums are on private land. The onus is on the government and its agencies to find land for the poor inside cities, and this needs to be done by optimising the use of unused and under-used land pools. As governments and the judiciary struggle to resolve the complex issues of urban land availability and housing needs of the poor, it is important that they consider that houses of the poor are not destroyed before formal housing, deemed suitable for human habitation with proper access to livelihood opportunities, is provided to them. An estimate by Mumbai-based Institute of Urbanology shows that between 1997 and 2002, the government and builders built 500,000 houses in urban India. During the same period, people built 8.5 million units in informal settlements. If every informal house had access to professional design and engineering services not constrained by planning restrictions and cost, the slum story of urban India would have been very different. After all, if government agencies had empowered people by facilitating civic infrastructure, including sanitation, wherever they are, slum dwellers wouldn't have been found defecating on tracks in the first place.